Simon started his career as an apprentice at Portsmouth, before making a move to Bristol Rovers in 1988. After a short spell with the Pirates, he moved to Wycombe Wanderers in 1989 and had a long and successful time with the club, helping them into the Football League in 1993 as well as winning the FA Trophy the same year. It was with his time at Wycombe that he won his England semi-pro international caps. After seven years at Wycombe and some 269 appearances, he joined Slough Town in August 1996, before joining Diamonds in January 1997 for a £6000 transfer fee. He scored on his debut at Farnborough, but his chances in the Diamonds first team were limited. 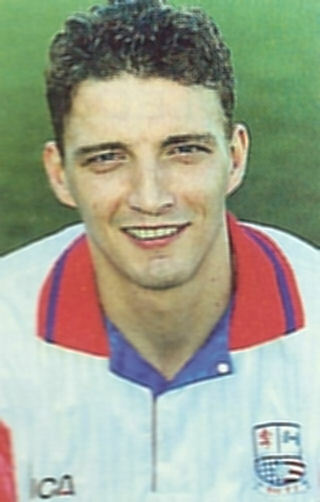 After a poor start to the 1997/1998 season, he was released and joined Stevenage Borough, and within a couple of months was facing Newcastle United in the FA Cup. He left Boro’ in 2000 to pursue a coaching career, first with Windsor & Eton, and then with nearby Maidenhead United in 2005. In 2006, he joined Freeland FC of the Witney & District League as player / coach.